Closed cell gasket tape conforms to accommodate thermal expansion caused by seasonal temperature changes while preventing light, moisture and air from seeping in and out of the mobile home or RV. Flexible foam sealing tapes keep your recreational vehicles comfortable, quiet and energy efficient. RV sealing tapes are provided on 3” core tube cut to any width. 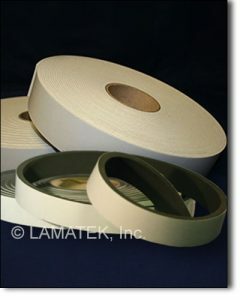 LAMATEK also supplies continuous spooled tapes for high volume manufacturing applications. LAMATEK’s gasket tapes cover a wide spectrum of specialty requirements from FDA food safety, UL-94 flammability ratings, automotive specifications, and UV or high temperature resistance. Whatever your requirement, we have a sealing tape that’ll work for you. Contact us today to discuss your application.